Bath- Anne F. Melrose, 85, of Bedford Street died Monday, March 18, 2019 at Horizon’s Living & Rehab Center. She was born in Bridgton, Maine on November 11, 1933, the daughter of James and Gladys O. (Chadbourne) Fitton. 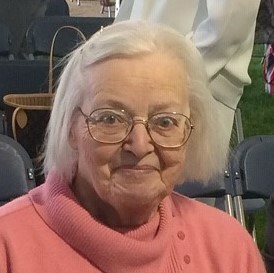 Anne graduated from Bridgton High School as Valedictorian in 1951 and graduated from Bates College in 1955 with a Bachelor’s Degree in Biology. After graduating from college, she taught at Buckfield and Lisbon High Schools where she coached basketball and softball. Anne was a frequent substitute teacher at Bath Middle School and Morse High School from 1977 until her retirement in 2007. Anne was active in Bath area Girl Scouting for 50 years, serving as a troop leader at all levels and in the Longreach Service Unit. She traveled to England with her troop in the 1980s. Anne served in the Civil Air Patrol with her husband and obtained the rank of Major. She served the Commander of Pine Tree Senior Squadron for over 30 years. Anne was an avid reader, often reading four to five books a week. She enjoyed playing the piano, singing, knitting, gardening and was an excellent cook. Her sons in law were always treated to her homemade apple pies any time they came for a visit. She enjoyed spending time with her six grandchildren. Anne married Joseph R. Melrose, Jr. on June 26, 1960. They were married for 54 years before his death on December 16, 2014. She lovingly cared for Joe during his extended illness. She is survived by three daughters, Elaine Baker and her husband Daryl of Littleton, MA, Marilyn Melrose and her husband Craig Stearns of Haverhill, MA and Susan Yurek and her husband Edward of Bath, six grandchildren, Katherine Baker, Sarah Baker, Collin Stearns, Nicholas Stearns, Patrick Yurek and Karen Yurek and her dear cousin and life-long best friend, Eunice Fitton of Bridgton. The family would like to sincerely thank the nurses and CNAs of Dionne Commons and the Horizons Living Center for their loving care over the past two years. Visiting hours will be held from 6 to 8 PM on Saturday, May 18, 2019 at Daigle Funeral Home, 819 High Street, Bath. A funeral service will be held at 2 P.M. on Sunday, May 19, 2019 at Small Point Baptist Church, Main Road, Phippsburg. Burial will follow at Oak Grove Cemetery in Bath. Memorial contributions may be made in Anne’s memory to the Bath High School Alumni Scholarship Fund, P.O. Box 1030, Bath, ME 04530. Condolences may be made online at www.Dailgefuneralhome.com. There's still time to send flowers to the Visitation at the Daigle Funeral Home from 6:00 PM to 8:00 PM on May 18, 2019.